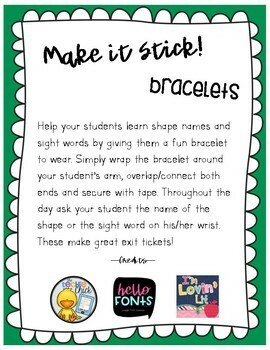 Help your students learn shape names and sight words by giving them a fun bracelet to wear. Simply wrap the bracelet around your student’s arm, overlap/connect both ends and secure with tape. Throughout the day ask your student the name of the shape or the sight word on his/her wrist. These make great exit tickets!